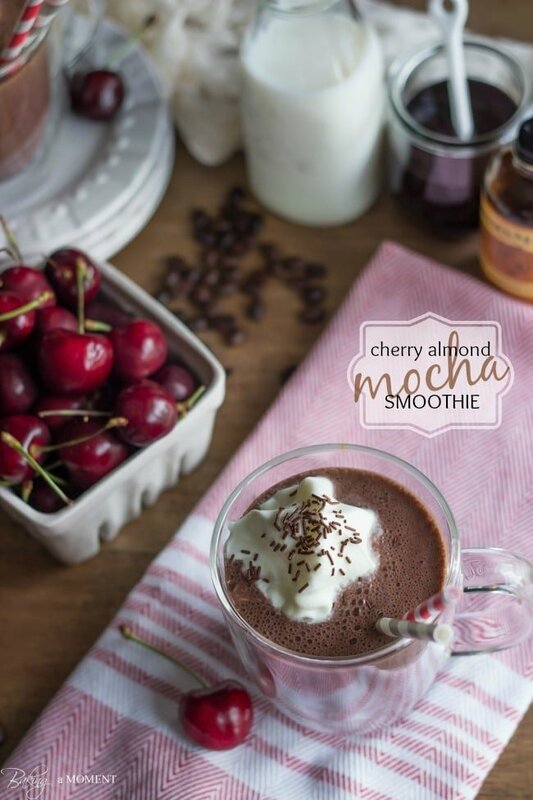 Sip on this Cherry Almond Mocha Smoothie: it’s a sweet and seasonal pick-me-up! I haven’t really been able to keep up with my social media much, so if you follow me on Facebook, Twitter, Instagram, or Google + you may have noticed I’ve been pretty quiet. I also haven’t been able to comment on my friends’ blogs very much, but I tried to make up for it by pinning a lot. And my own comment inbox is overflowing, so please be patient with me this week as I try to answer all your sweet messages over the next several days! I whipped this treat up two weeks ago and snapped the pics, but I’m just getting around to filling you guys in on it now. It’s awesome! I went back and forth on whether to call it a frap or a smoothie, but in the end “smoothie” won out because it ended up being mostly fruit. Let’s talk about this fruit, shall we? I was beyond thrilled to receive this mahoosive crate of fresh, plump, juicy black cherries from Stemilt Growers. Seriously. Are cherries like the best, most awesome thing about summer or what? I truly look forward to them all year ’round, and now they’re finally here! And I’ve got tons, woot! For years I pushed off the purchase of my cherry pitter, and I have no idea why. It’s a great tool and really kind of essential if you want to be able to take advantage of the opportunity to bake with fresh cherries. Or, if you’re like me and you have little kids that can’t seem to figure out how to spit out the pit! 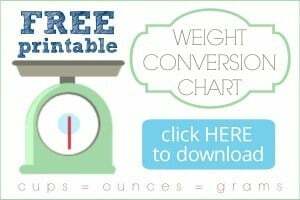 I love feeding fruit to my kids and I don’t want them to not be able to enjoy cherries in summer. That’s just un-American. Get yourself this cherry pitter stat, and if it makes you feel any better, it works great with olives too. 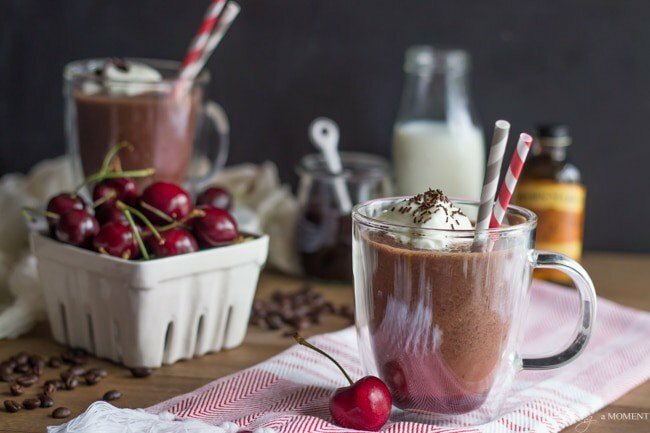 So, besides the gorgeous cherries this smoothie also has coffee, chocolate, almonds, and milk. I used dairy milk but I’m sure it would be equally delicious with almond milk too. Almonds and cherries are a classic combo, for good reason. They’re actually in the same family and the flavors complement each other beautifully. I really think you are going to love this smoothie! It’s kinda different, in that the flavor is so rich and intense. Once again we have a foodie love triangle happening—> coffee loves chocolate loves cherries. Win. 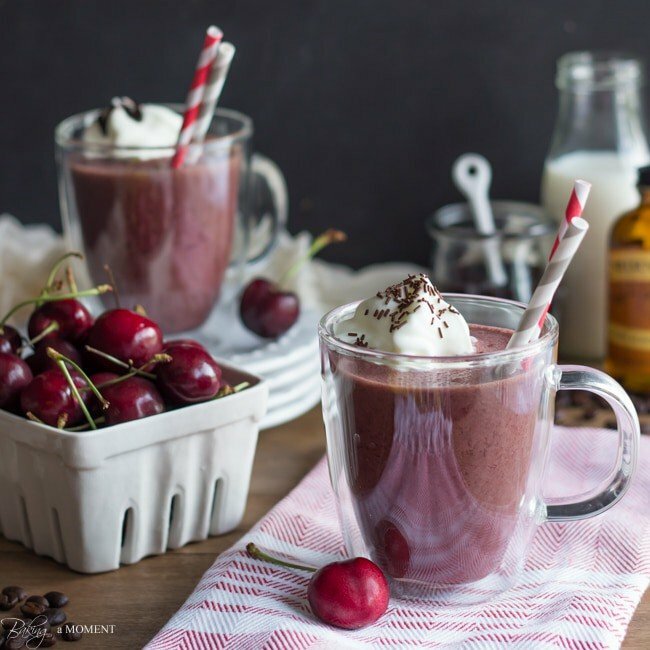 Sip on this Cherry Almond Mocha Smoothie: it's a sweet and seasonal pick-me-up! All of my favs in one smoothie, love this one! Thanks Matt! I am a coffee fiend and I really loved the way the cherries and chocolate worked in there. Thanks for the great comment! Lol you won’t regret it! Thank you sweetie! ugh you have no idea! I’m hoping to slow down a bit in August. Thank you sweetie! If I wasn’t allergic to cherries, I would seriously be all over this! Beautiful images as usual! Oooh, I feel so bad for you!! But thank you! Love everything about this! Just can’t decide what part is the best. Pinning. Hope you had the best vacation! It’s hard to get back into the swing of things sometimes. 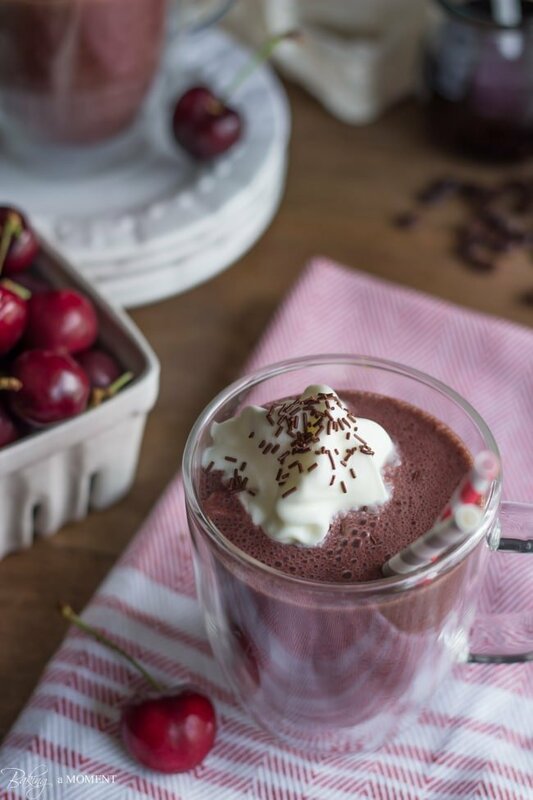 I just love everything in this smoothie- coffee and cherries are a great combo. So hard, seriously. I don’t know what’s better, to have guest posters while you’re away or when you get back! Next time around I’ll play it safe and do both, lol! Truthfully I wasn’t sure if cherries and coffee would work but it so did! I loved the flavor 😀 Thanks Sherri! Such a great looking smoothie!! I love cherry and almond together so I definitely have to try this soon! Arent’ cherries and almond just so great together? I love them too and especially with chocolate 😛 Thanks for stopping by, Rachel! Oohh!! 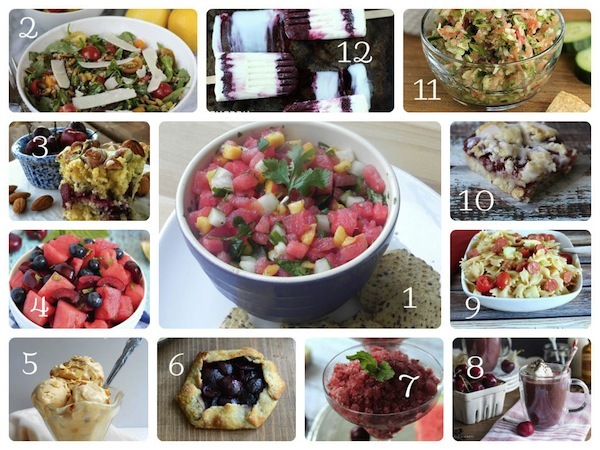 This recipe looks so good!!! I love adding frozen cherries in my smoothie. I am not a coffee drinker but my husband is and I am going to forward this to him! He is the king of smoothies! Thanks for sharing! My pleasure, Ester, and thank you! I really loved this one- the cherries tasted so good with the coffee and chocolate. I hope your husband enjoys as much as I did! You had me at almond mocha and then I was sold at smoothie! Im not much of a cherry fan but I am willing to give this gorgeous smoothie a shot!